Great New Experience in Virtual Reality Crime Investigation! Glenda Bixler is a first-rate book reviewer with a wonderful blog, Book Readers' Heaven, where she posts her book reviews. 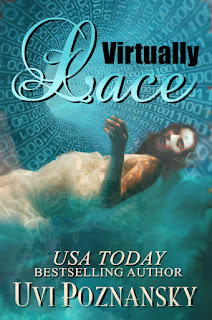 I am honored to find her review of my techno-thriller Virtually Lace. 5.0 out of 5 starsGreat New Experience in Virtual Reality Crime Investigation! While Michael was contemplating whether or not he could create Laguna Beach within a virtual reality setting, what actually came about was quite different. He had watched an attractive girl run by...and started following her. He didn't know why but before he could catch up with her, she was dead... But he recognized her--her name was Lace. But he didn't stay or call the police... He struggled with his options, going over whether or not the killer might be watching him right now...or whether he had seen the killer. She was already dead--he had tried to save her. But it was too late... By the next morning he tried to convince himself that he had to forget the whole thing... But the secretary threw the newspaper onto his desk, with the headlines up for him to catch, while she told Michael that their boss wanted to see him right away. Michael was concerned about meeting--this company had been taken over. And Ashley, who was loved by Michael, was not there to meet... She had been personally assaulted but had not shared it with anyone at work. This time, he knew, the boss was going to take advantage of her being absent...and fired her. But it was more than that...they had both been happy and productive in virtual reality simulation, but that had been for games and similar uses...now the company would be using it to serve politics--war. Still I was not prepared for whodunit. Who knew that pearls would provide a major clue...but also lead to danger for both Michael and Ash... This is a totally satisfying venture into the use of virtual reality within crime scene investigation. It is new, refreshing, and unique in mystery or police procedure novels and I'm certainly happy to have gained the experience from a writer of multiple genres who keeps surprising me with the scope and diversity of her books. Do search my reviews under her name for the books I've been fortunate to read and review... This was the first of this genre for me; it was tense, detail-oriented and indeed gave a whole new perspective to crime solving in books. Jane Austen for best screenplay?